Howdy! 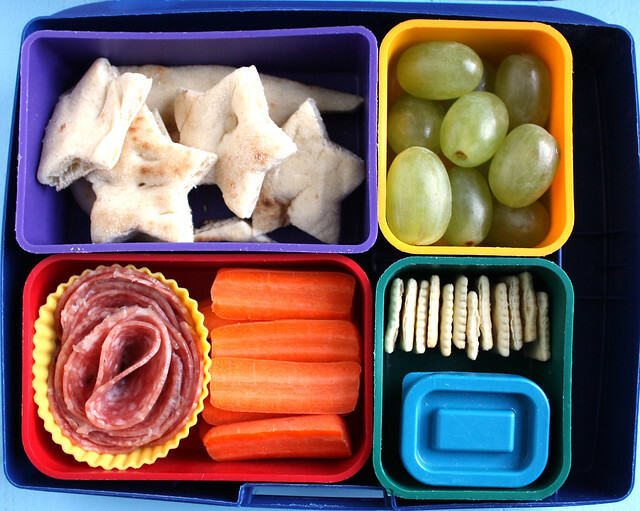 Check out my boys’ lunches this week — including a rare day with twin lunches. Exciting! On Sunday night, I made frozen turkey corn dogs for the kids for dinner because I was too tired to cook and needed something fast. As they were eating them, they both started asking me why I never put corn dogs in their lunches. I explained that we only have them sometimes because they’re not the healthiest food, but I also wondered why they were suddenly asking. Apparently, their friends at school get them in their lunches “all the time“. Really? Who knew? Is this a thing? I had no idea! I told them they could each have a corn dog lunch this week, and Wyatt asked for his first thing Monday morning. He also had: grapes, some ketchup to dip the dog in, carrots, black bean dip, and a pita that I toasted, lightly buttered and sprinkled with garlic salt. Incidentally, when I looked inside the PlanetBox at the end of the day, Wyatt had eaten the hot dog, but he left the corn part. I’m guessing corn dogs might be a short lived thing with him…. 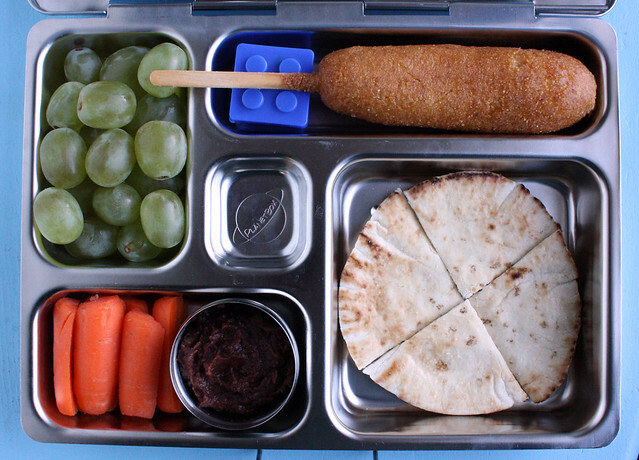 Tuesday Augie requested his corn dog and he also asked that I pack his lunch in the Laptop Lunch box. 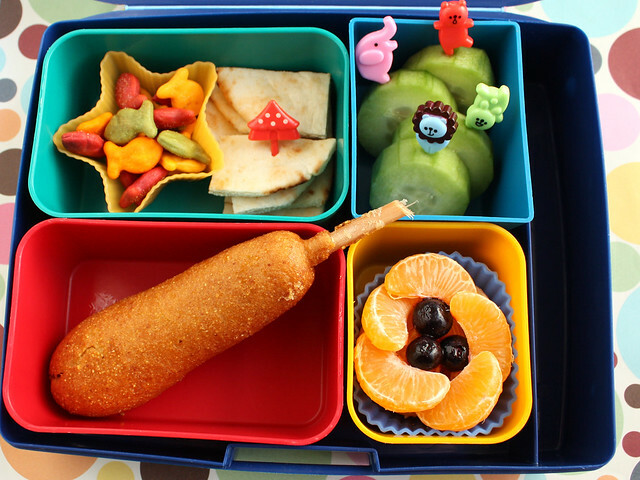 The corn dog and the bright colors in the lunch box got me thinking about the circus, so I made this lunch with a bit of a circus theme. In addition to the corn dog, I packed rainbow goldfish crackers, garlic pita chunks, cucumber slices with animals balancing on top (I used these picks) and a clementine flower. I added a few frozen blueberries in the center of the oranges, too. Wyatt had leftover pasta from dinner that I heated and packed into the thermos. 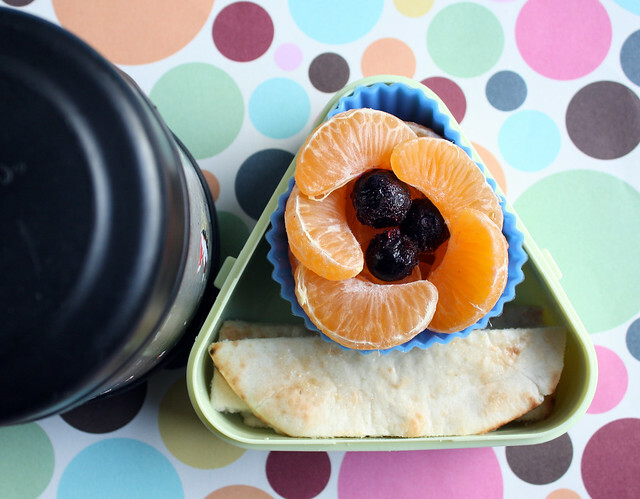 I also made him a side car with oranges and pita strips, but then I forgot to put the container in his lunch bag, so I re-purposed them in Augie’s lunch (see up above) to keep them from going to waste. On Wednesday, the boys had twin lunches. There is often overlap with the foods I pack for them, but their food tastes are so different that they rarely have identical lunches. Today was the exception! 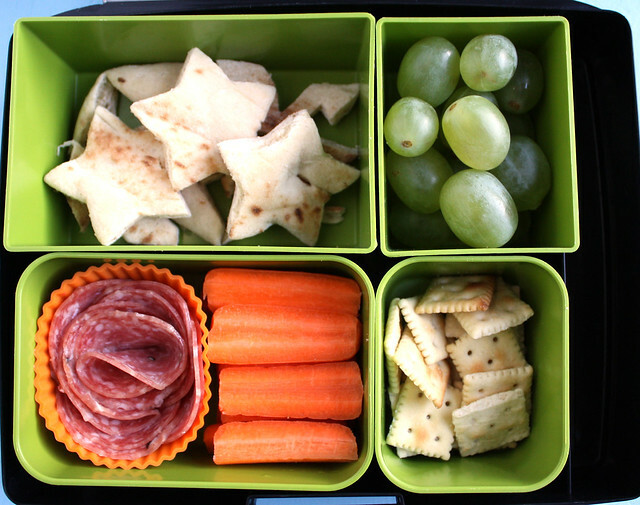 Both lunches were packed in Laptop Lunches boxes and they held garlic naan stars (the scraps are visible underneath), green grapes, mini saltines, carrot sticks and salami slices. And here is Wyatt’s! The only difference was that I gave him a small container of bean dip for dipping his carrots. Augie opted out of a dip so I just gave him a few more crackers. I think it’s also interesting to see how the colors of the boxes these are packed in makes these meals look so different. Which box do you prefer? 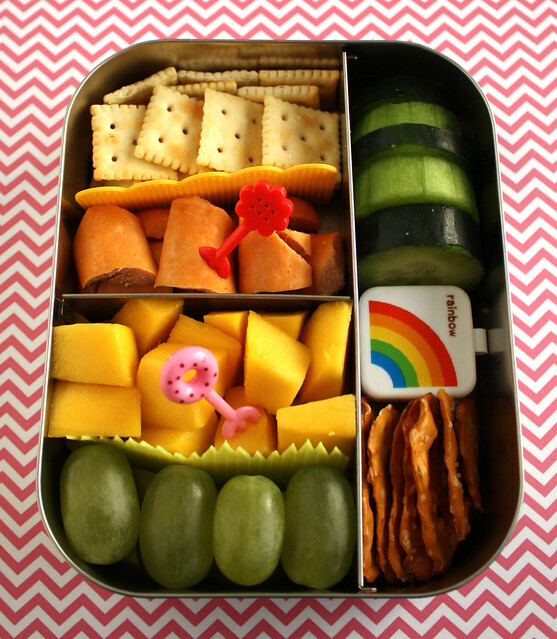 On Thursday, I packed Augie’s lunch in the Lunchbots Trio: mini saltines, hot dog chunks, mango, grapes, pretzel thins, a little hummus (in the rainbow box) and cucumber slices. In also included a couple cute picks for him to use as mini forks. 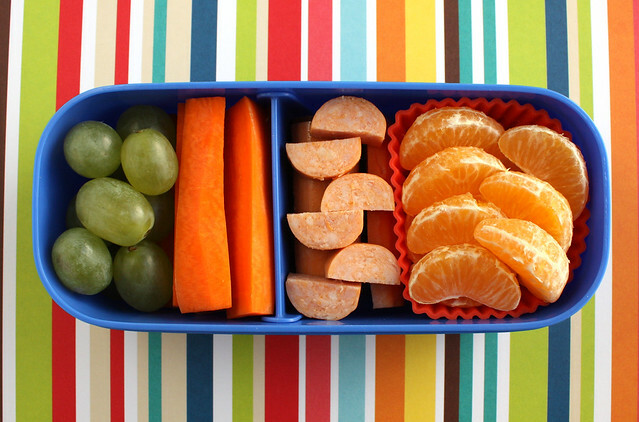 Today, Augie had grapes, carrot stickes, hot dog chunks and mandarin orange wedges. The oranges were packed in a semi-circle shaped silicone baking cup from a Wilton Build-A-Cake set . I recently picked up this set for cheap at my local Ross store and I think they’re a great purchase for a bento-packer. The set comes with 24 baking cups in a ton of different shapes: round, square, diamond, triangle, wedge and the semi-circle above. Unless you’re packing a lot of lunches every day, 24 cups is more than you’ll probably need but you could split it with a lunch-packing friend to lower the cost a little. 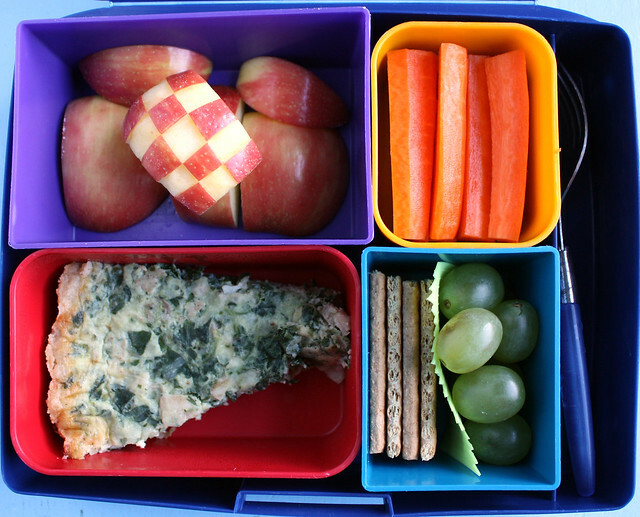 Wyatt had apple chunks (including a small checkered apple piece, carrot sticks, green grapes, graham crackers and a piece of spinach and artichoke quiche. WHO in the WHAT now?? I made the quiche for dinner with zero expectation that either kid would eat it, but I always put everything I make on their plates and encourage them to at least try it. To my great surprise, Wyatt ate his slice immediately and then asked for seconds and a piece in his lunch box. Um…OK. How has your kid surprised you lately?